St. James Lutheran Church is a member of the Evangelical Lutheran Church in America (ELCA) and a member of the North/West Lower Michigan Synod. The ELCA is broken up into nine geographic regions and a synod is a smaller geographical area within the region. Our synod, the North/West Lower Michigan Synod is in region 6 and is one of 6 synods in the region. As members of the synod and the ELCA, we are joined with other Lutherans and Christians throughout North America and the world. 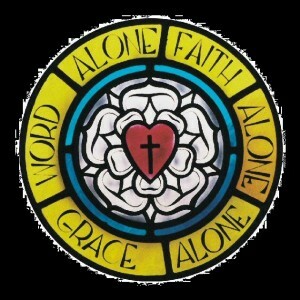 Lutherans are a denomination of Christianity that was formed shortly after the Protestant Reformation in the 16th Century. We believe in the triune God, which means that we confess God is the Father, the Son, and the Holy Spirit. Lutherans gather each week for worship to celebrate the good news of God’s love and forgiveness, to hear the Word of God (the Scriptures), and to share in the meal of Holy Communion that nourishes and strengthens us to go into the world to be God’s people in our daily lives and our life’s work (vocation). We are a denomination that lives out our faith by loving and serving others who are in need. Specifically, What do Lutherans Believe? Tell Me More About What you Believe. We believe that God acts out of love and grace (which is God’s love freely given) and that ultimately it is love that changes people. We see God as both revealed and hidden. The crucified Jesus reveals to us the heart of God. Yet for us God remains a deep mystery. We think we need to be a bit humble when it comes to making statements about what God is up to in the world. We believe that the ordinary world is where God meets us. We think that God comes to us through means like water, bread and wine, and other people. We think that Christians of today are connected to Christians of every time and place. We do certain things in worship and in church life because those things reflect our deep connection to those who have come before us. We are people of tradition, but believe that changing and being changed is what our tradition is all about. We Lutherans believe that before God an in the presence of the crucified Jesus all of us are beggars. We think that ultimately our worth and purpose in life come as gifts from God, not from anything we do. Some of the information on this page was adapted from the Evangelical Lutheran Church in America’s web site.